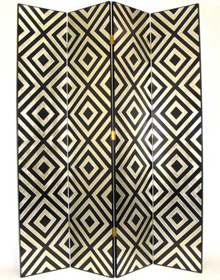 Room Divider Screens are a great way to break up a large room or create a private dressing or storage corner. Birds, Bears, Horses, Giraffes, Tigers, Lions and More! These animal theme room divider screens are great for kids rooms, play rooms, dens or dressing rooms. 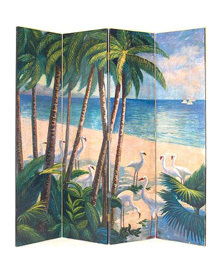 Sail away with these realistic hand painted screens.The beach and nautical theme room divider screens are the perfect way to bring the beach to you while dividing a large room or creating a private corner. 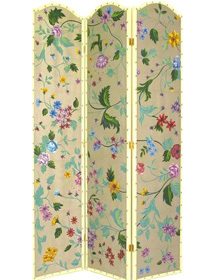 These floral screens are a great way to split up a large room or create a private changing area or storage corner. 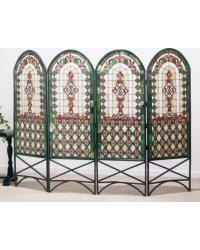 Choose a beautiful floral room dividers screen to add a touch of class to any room or space. Beautiful Tiffany style glass room dividers and partitions. Choose from floral, abstract and stained glass designs in a variety of sizes and designer colors. The Contemporary Screens Collection includes contemporary & modern room divider screens and folding screens. The abstract designs on these modern screens will enhance any room and add a contemporary flair to your modern themed home or office. Asian Screens and Japanese Room Dividers create a traditional decorative look. 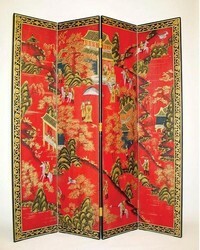 Lovely Oriental Room Divider Screens add a unique Feng Shui element ro your room. 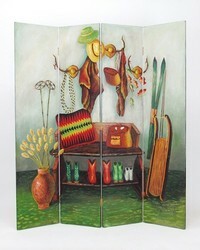 Choose a room divider screen with an elegant asian themed design including oriental landscapes, exotic birds and more. These western themed room divider screens and partitions are a great way to bring an Old West style into your home or office. Cowboys, horses, desert landscapes, wildlife and more. Whether searching for a rustic wood screen or a sturdy modern divider the Wooden Room Divider collection has something for every taste and home decor style.